Now in fifth year IGNITION: Future Of Digital is moving to a new venue, The Times Center in New York. We'll have an opening kick-off in the afternoon of the 1st, followed by two days of jam-packed sessions on Dec. 2-3. The event explores the future of media as it intersects with technology and changes everything from how we consume information to how we market, invest, socialize, work, live, and play. IGNITION brings together the brightest minds in technology and media to share what they see on the horizon. It packs unscripted interviews, cool demos, insights from industry pioneers, and big picture thought leadership into a fast-paced agenda. You'll learn about the key trends in the post-PC era, from social to mobile to e-commerce, digital payments, cord-cutting, big data, internet of things, wearables, and more that are all defining the emerging web economy. At the same time you'll pick up insights that can transform your work or even your company. At IGNITION you'll get a new understanding of the transformations taking place in the digital world. We'll discuss the innovation that matters and help you understand what you can do to keep ahead. You'll have the chance to network with 700 senior executives from the worlds of technology, media, entertainment, investing, finance, and the Internet. The conference is produced by Business Insider, one of the fastest-growing digital-media companies in the world, and hosted by Henry Blodget, Business Insider's Editor-in-Chief and CEO. 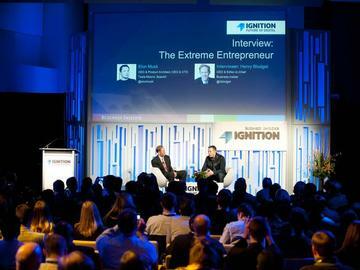 You may transfer your registration to another person by November 6, 2014, by providing authorization to us at ignition@businessinsider.com.